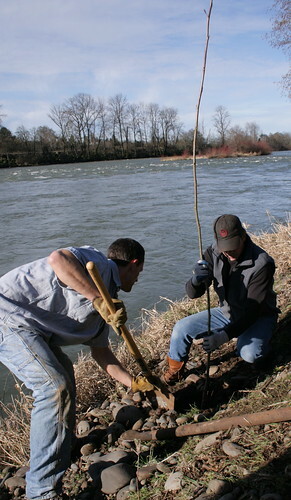 TU 678 is involved in native coldwater fisheries conservation in the Willamette Valley. Willamette River restoration Whilamut Natural Area: TU volunteers are working with the Eugene Stream Team to restore native riparian vegetation in the Whilamut natural area of Alton Baker Park on the Willamette River. What began 2007 as a blackberry thicket has been transformed into an area where native vegetation may again thrive. TU Chapter 678 hosts regular blackberry removal and replanting sessions. Carmen Smith Hydropower relicensing: Spearheaded by Trout Unlimited’s Kate Miller, our chapter entered into negotiations with EWEB to provide greater environmental protections and enhancement actions while allowing EWEB to continue to operate the Carmen Smith Hydropower Project. The agreement is a positive step for restoring endangered spring chinook salmon and bull trout populations in the Mckenzie basin while allowing EWEB to utilize a clean, non-polluting energy resource. Green Island restoration: TU 678 teamed up with McKenzie River Trust (MRT) to work on the organization’s ongoing Green Island Project. This island, over 1,000 acres in size is located at the confluence of the McKenzie and Willamette Rivers and was purchased by MRT. Once an active floodplain, the previous owners built up flood control levees around the property to keep flood waters and migrating channels from inundating the agriculture fields. TU 678 helped fund the notching of one of these structures, reconnecting the island to the rivers and improving the riparian habitat for juvenile native salmonids, while removing habitat for invasive warmwater species. The chapter also works to plant trees on the property. 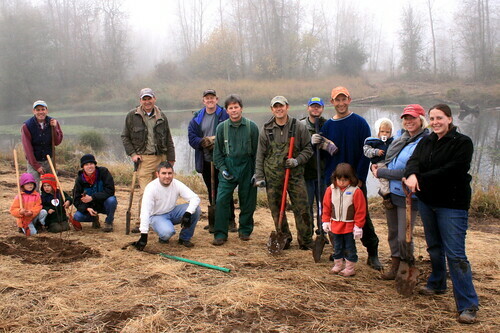 Upper Willamette Bull Trout habitat enhancement: In 2006 TU Chapter 678 secured a $10,000 grant from Trout Unlimited to fund habitat restoration in the Upper Willamette watershed to improve spawning habitat for bull trout. The Chapter also worked on the monitoring and follow up to this project. The chapter is currently working to secure more funding for habitat restoration in this area. McKenzie River Bait Ban Coalition: Would you support a bait ban regulation on the McKenzie River to protect wild trout? TU 678 is participating in a coalition of guides, local businesses and conservation groups spearheading an effort to get a bait ban for trout on the McKenzie River. This regulation would maintain the current salmon and steelhead bait regulations, while making the section of river above Leaburg Lake artificial flies and lures only for trout. Stopping the WOPR: As anglers who care deeply about the health of our coastal salmon and steelhead, we can’t sit quietly by as the Bureau of Land Management puts local rivers at risk. The Western Oregon Plan Revision (WOPR) is the BLM’s attempt to ramp up logging and dramatically reduce riparian protections on 2.6 million acres of land in the western part of the state managed by that agency. TU Chapter 678 has lead the charge against this plan, as so many of the rivers in our area would be affected, including the Siuslaw, the Umpqua, the Alsea, the Rogue, and the Smith. TU 678 hosts a handful of recreational fishing outings a year, including trips on the Lower McKenzie for the March Brown hatch, wilderness backpacking trips into the Cascade High Lakes, and roadtrips to southern Oregon to fly fish for chinook salmon on the Elk and Sixes Rivers. TU Chapter 678 relies almost entirely on local fund raising efforts. We do not receive operating funds from TU National or the Oregon State Council. We host an annual McKenzie River Two-Fly Tournament (October 10, 2009). 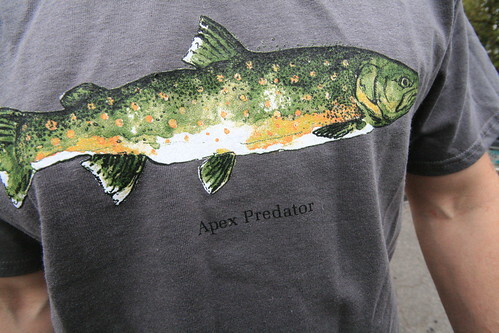 We also host an annual auction, bring fly fishing movie events to the Eugene area, and created an Oregon Bull Trout T-shirt to fund upper watershed bull trout habitat restoration. TU Chapter 678 meets the second Wednesday of the month at 7pm at the Eagles Aerie, 1375 Irving Rd., Eugene, OR. Each month we host a conservation speaker/leader from the area. Meetings are open to the public. So anyway, you guys/this local chapter is/are a stand up group. I have never been as pleased as I am with any other club when it comes to the things I have learned or have come to better understand, than in this TU chapter. You don’t back down an inch or not do something just because it’s going to be a hard road to get accomplished. And that alone sets you apart from any other ff club or organization I know of. I hope I and Monica can be of help to our chapter. I would really like to get involved in some volunteering with the Chapter 678. I would like some info on what I can do to help. Same as Cam (above). I’ve been a member of TU – off and on- since moving to Oregon and I’ve never been contacted by any local chapter for anything. I pay my money, I get my calendar and–well, “Thanks for the 35 bucks,” I guess. I’d like to be more than just a paying recipient of a calendar. Just call me or write me and ask.